You can tell when a great photographer has taken a photo. There’s something about the setup, the light, the look, the angle and the colors. It just looks ‘different’. That’s not a fluke. If you’re tempted to take your own photos to publicise your hotel and you’ve never taken a photo before, then you’ll find it’s difficult to get started. Your photos won’t have that ‘look’ that makes the hotel gardens look their best or the hotel itself leap out at you, and you might feel deflated. You might even blame the camera and maybe buy another, more expensive one. However, it’s probably not the camera. You see all those settings on the top? Do you leave it on ‘auto’? Most people do, and that’s fine. Some of the best cameras on the market these days will do a cracking job of focusing, setting aperture and ISO etc. Just take a look at the screen when you point it at your subject and see what it’s doing, all in front of your eyes. However, that’s not creativity. A great photographer knows how to get a scene right and take a photograph that will look fantastic, and he does this because he knows what all those settings mean. He doesn’t simply set it to automatic and then fix everything in PhotoShop. Of course, doing it yourself is much cheaper, short-term, but you shouldn’t discount the benefits of getting all your photography expertly shot by a professional. Especially a professional who specialises in hotel and resort photography. Both photos and video can ‘sell’ your resort. Think back to the last time you tried to find somewhere to stay. You checked out websites or flipped through brochures, and the chances are you saw some incredible photography. 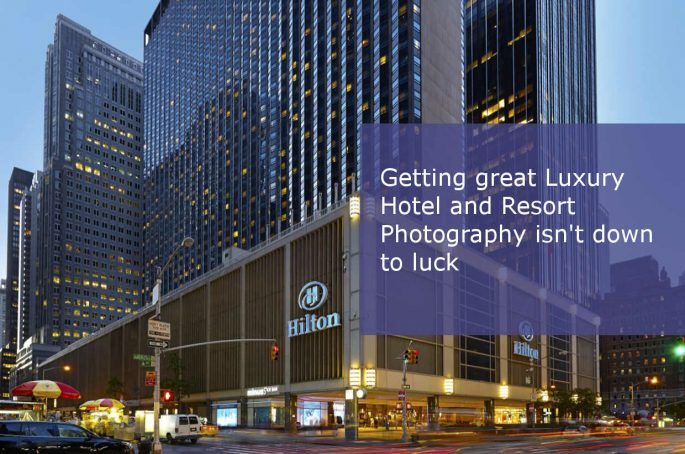 It’s probable that you chose your hotel because of the photography, too. So many hotels fit into the ‘four-star’ review category that it’s impossible to use ratings to choose anymore, and so the resorts that make an effort are the ones that win the customers. Great photos for brochures, incredible videos for websites and presentations, all of this adds up to a great investment that will reap rewards for years to come.